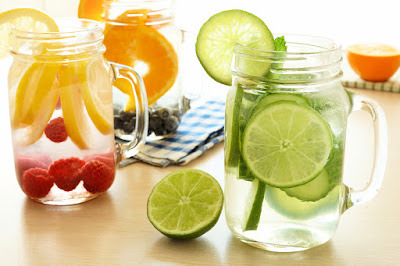 Learn how to lose 3 to 9 pounds in just one day with a simple to do one day liver detox. Combine 1 cup of unsweetened cranberry juice with 7 cups of water. Bring to a gentle boil. Remove from heat. In a tea ball (or coffee filter tied off) steep 1/2 tsp of ginger, 1/2 tsp of nutmeg and 1 tsp of cinnamon in the cranberry/water mixture for 15 minutes then remove. Add 3/4 cup of orange juice and 1/4 cup of lemon juice to mixture and stir. Refrigerate. Weigh yourself first thing in the morning the day you start your detox. Weigh yourself again the morning after the day of your detox. Upon wakening, drink one cup of the cranberry mixture. Then alternate the next hour with a full cup of water. Then drink a cup of the cranberry mixture the next hour and water the next hour and so on until you finish the mixture.